President Trump has long established his love and admiration for despots. First it was Vladimir Putin of Russia, then Recip Erdogan the soon to be dictator of Turkey, then Rodrigo Duterte, the murderous President of the Philippines, and even praise for Kim Jong Un of North Korea. Let us not go into the list of draconian despots, dictators from history that the President has expressed his fondness. His favorite President is Andrew Jackson who defied a Supreme Court ruling and executed the Trail of Tears. Honestly, if the President’s admiration, praise, and fondness for authoritarian and anti-democratic rulers remained just his opinion with no consequences it wouldn’t be such a big deal. However, it is much bigger than his personal opinions, but the nature his office of President, his words, his tweets, his opinions, become the policy of the United States, and end up staining the honor of the nation. These actions have consequences. The first is the loss of moral authority of the nations who encourage and help dictators. Second, the loss of that moral authority makes it difficult when the chips are down to gain domestic or international support once a nation’s leaders determine that aggressive dictatorships must be stopped, finally it is the death of the Republic, its Constitution, and its founding principles. Just in the past few days the President has bowed to the wishes of the Chinese Communists on trade and the North Koreans on our alliance with South Korea. As he did these things he made more and ever more threatening attacks on the Department of Justice and the FBI in order to discredit them and end the investigation of his family and presidential campaign ties to Russia and other foreign enemies. What the President and his administration since they took power is amoral and it is dragging the reputation of the United States into the sewer. Sadly, it will have real world consequences, as well as dangerous ramifications for our own system of Constitutional government and representative democracy. This is not new, during the 1930s many leaders of struggling democracies caught up in the Great Depression, including the United States offered up praise for the accomplishments of Mussolini, Stalin, and Hitler. By their encouragement, accommodation, and appeasement these leaders were complicit in some of the greatest crimes against humanity ever seen in the world. Some of these leaders, especially in France actively worked against their own democratic form of government in the hopes of overthrowing it and setting up a Fascist state. 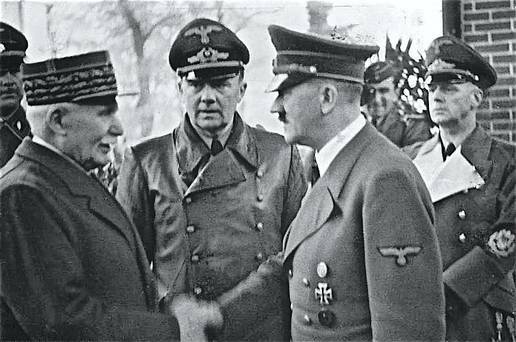 Once France was defeated by Germany the anti-democratic leaders of that country voted out the Republic and established a dictatorship at Vichy headed by Marshal Petain, the hero of the First World War. 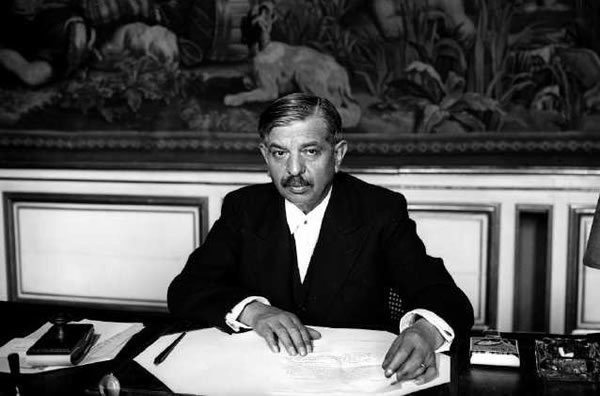 One opponent rushed to Vichy to oppose the measures, Pierre-Etienne Flandin, told his colleagues: “Change the Constitution? But why? What need is there to change our institutions? The reproach is that we did not respect them.” However, Flandin too had no problem with giving the reigns of power to an authoritarian, Fascist regime that would cooperate with the Nazis, turn on its allies, and murder its own citizens. His words were absolutely correct, but he betrayed himself at the end. President Trump has much the same attitude as he issues executive orders with abandon, even as others are struck down by the Courts. Last week he threatened to overturn and in effect destroy the Fourteenth Amendment by ending birthright citizenship by executive order. The threat is unconstitutional as hell but it is a threat to the civil rights of all Americans, but back to Vichy. But just as troubling on the domestic front is the President’s stated desire to crush the parts of our Constitutional system that inconvenience him, and with his malleable GOP majorities in the House and Senate he may eventually succeed in doing if not opposed by courageous Senators and Representatives, and the Courts. He has on a number of occasions threatened the independence of the judiciary, he has expressed a desire to amend the Constitution to limit freedom of the press, freedom of association, and freedom of speech. He has also urged Congress to end the Filibuster which is the last resort by which a minority party can prevent bare majority of Senators or Representatives of one party to impose its will on the entire nation, even if the majority of people in the nation voted against their party. As of now GOP Senate leaders have announced their opposition to such legislation realizing that they could once again be in the minority. However, for Trump that does not matter as he has no loyalty to the Republican Party; sadly, most Republicans do not seem to understand that fact, and I wonder how firm they will stand when push comes to shove. History shows us that all too often, even the opponents of authoritarianism can easily turn from defending their Constitutional liberties to supporting nationalist, racist, and authoritarian leaders. That my friends should frighten any American who has not lost their belief in our system of government which for all of its inefficiencies guarantees more liberty than any other system in the world. History shows that once those liberties are gone you do not get them back without the despot who has taken them away being defeated, often by military conquest. Unlike Laval’s Vichy Government the United States has not been overrun and invaded by an enemy Army. We don’t have Russian Tanks rolling down Pennsylvania Avenue, or Vladimir Putin doing a jig at the Washington Monument, but the President’s surrender to Putin, and other despots and his attacks on our Constitution and legal systems will destroy us and all of our rights; and that means even the rights of those people who for whatever reason support him. If this continues, they too will become victims of an American version of the Night of the Long Knives. The mid-term elections are on Tuesday. One never knows but they could be the last we ever have, or that will matter? Certainly the Germans of 1932, the Czechoslovakians of 1946, or the newly free “Russians who voted in 1990 did not think that this would be the last free and fair election in their country’s history…” did not think it would be, but it was. Take my warning for what it is. Trump’s opponents are already damned and doomed if he succeeds, but his supporters will have signed their own death sentences and they are too stupid to know it. But then, such is bliss of ignorance.